Seattle coffee roaster Caffe Vita in collaboration with 30+ Seattle artists, businesses and nonprofits has released GIVE, a downloadable music and video compendium to benefit Arts Corps, Seattle’s largest nonprofit arts educator, along with Ballard Food Bank, Rainier Valley Food Bank, University District Food Bank and West Seattle Food Bank. A full 100 percent of sales will go directly to GIVE beneficiaries. The $7 compilation – conceived and initiated by Caffé Vita, which produced, curated and funded the project – is available for purchase online as well as in Caffé Vita shops, Easy Street Records, Sonic Boom Records, University Book Store, The Crocodile EMP, and Neumos. These outlets all carry the GIVE packages, including physical cards with a redemption code for the download, as ready-to-give presents. 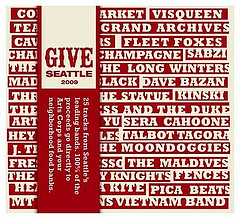 GIVE is a snapshot of the incredible creativity and diversity that defines Seattle’s music community in 2009. 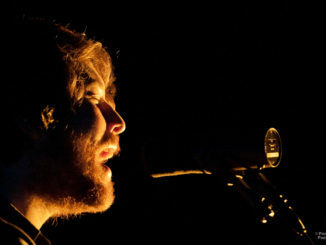 Among the musicians who have contributed tracks, nearly all of which are exclusive to GIVE, are modern folk bands Fleet Foxes and The Cave Singers; hip-hop artists D. Black, Fatal Lucciauno, Champagne Champagne, Fresh Espresso and Mad Rad; singer-songwriters Ben Gibbard of Death Cab for Cutie, David Bazan, Joshua Morrison and Fences; and indie pop acts The Duchess and The Duke, The Long Winters and Pica Beatscountry-influenced players The Moondoggies, The Maldives and Sera Cahoone; and rock ‘n’ roll outfits Visqueen, Tea Cozies, The Blakes and The Lonely Forest. Additional musicians include: Arthur & Yu, Common Market, Grand Archives, Head Like a Kite, Hey Marseilles, Kinski, Le Loup, Gabriel Mintz, Mt. St. Helens Vietnam Band, Pearly Gate Music, The Saturday Knights, Talbot Tagora, Throw Me the Statue, J. Tillman and Unnatural Helpers. A full track listing can be found at the GIVE website.